In addition to all the fantastic aquatic experiences available, Veligandu offers a whole array of land-based facilities to enjoy the sunshine and the tropical outdoors, including a volleyball court, a football ground and an outdoor swimming pool. If you prefer to stay in the shade, Veligandu has just what you need. Take full advantage of the modern indoor facilities of our Games Room and Fitness Centre and practice your favourite recreational activities such as table tennis, billiards, cardio or weightlifting. An excellent way to keep fit, recharge, and bond with your partner. Whether you prefer high-speed and competitive type of sports, enjoy more leisurely experiences in the presence of company or would instead opt for more chilled, solo activities, we’ve got something to please everyone. 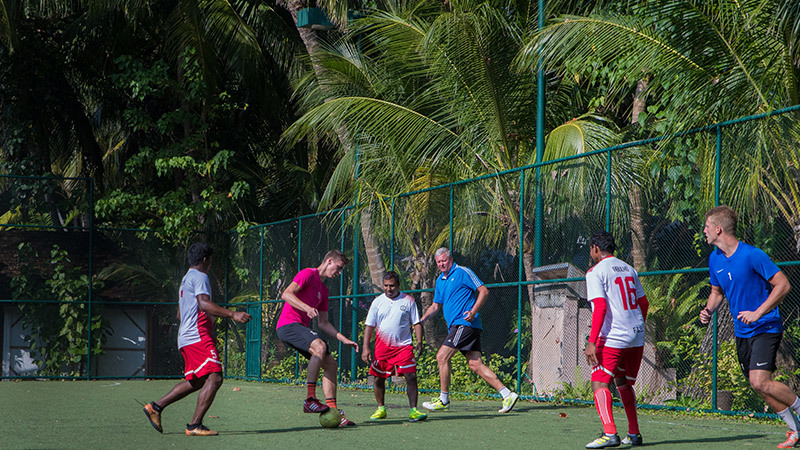 At Veligandu you will never have to wonder what to do in your spare time while vacating in the Maldives. Scroll down below and browse through what kind of land activities are on offer at Veligandu! Grab a racket and join us on the badminton court. Singles or doubles, night or day, great fun is guaranteed. Gather your friends and challenge each other’s football skills for some outdoor fun in the sun at our football pitch. Get active! Invite your partner or friends to bond over a friendly game of volleyball at our designated open-air court. Take a break from lounging about on the sun-kissed deck with a plunge in the in the infinity pool. Grab your partner and challenge another couple to a friendly match of table tennis at our Games Room.